It's time for the New Product Launch! All the Stamps, Die-namics, and Stencils can be found HERE. Please remember to visit each of the MFT Designers' January New Product Launch posts on the MFT Blog and leave a comment by the end of the day on Thursday, April 9 for your chance to WIN one of two, $100 Gift Vouchers. The winners will be chosen at random and all the prizes will be sent out on April 10. Ready? Set. Comment! 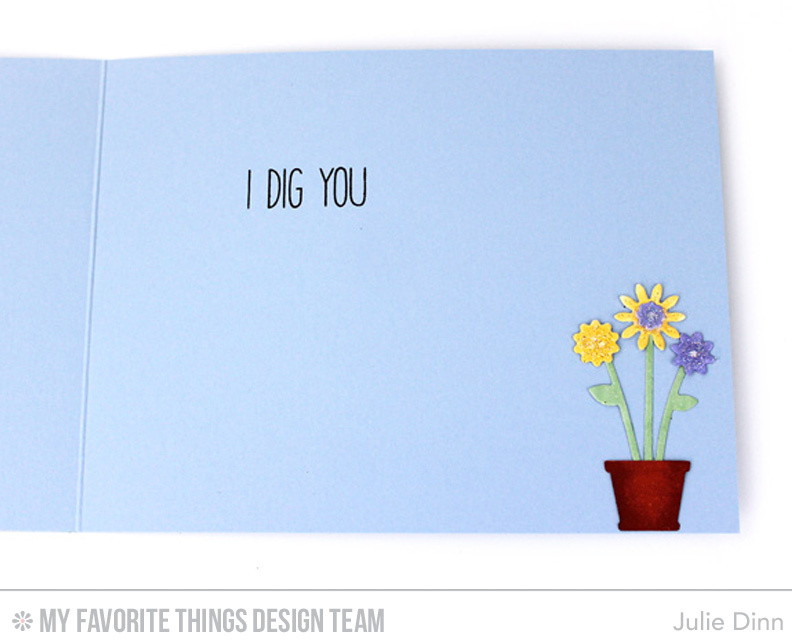 I have a fun spring card to share with you today. 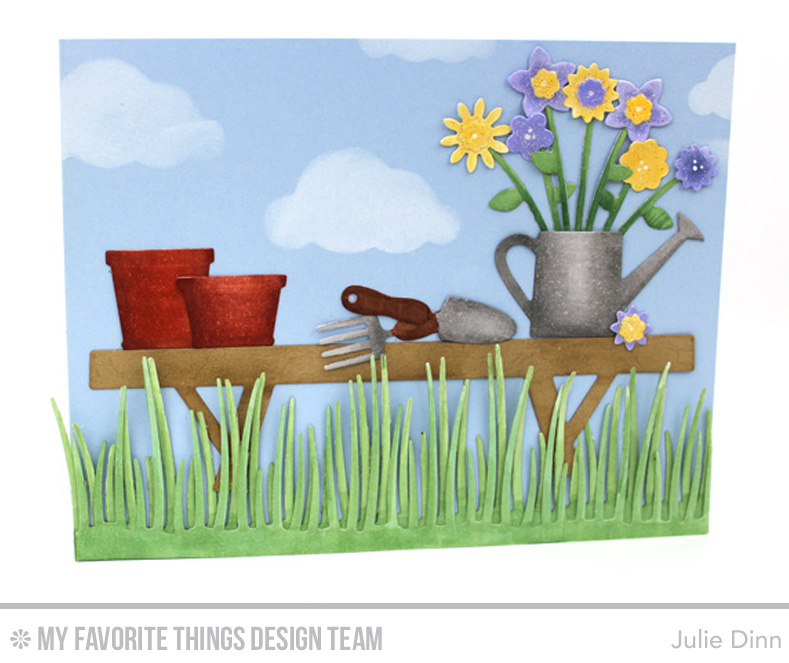 I features the new Spring Garden Die-namics. This set of dies is FULL of fun flowers, pots, bird houses, garden tools, and even a bench. To create the scene I die-cut all the pieces in X-Press It card stock and coloured them with Copics. I added a touch of sparkle to the flowers with the Sheer Sparkle Glitter Glaze. On the inside of the card, I stamped a sentiment from the You Gnome Me stamp set and added one more flower pot. What a gorgeous scenic card, Julie! Love it! I love the little flowers! I love this whole coloring on the die cuts... Just adorable, I really love this set of garden dies! This is the cutest garden bench ever! Such a cute springy scene! Thanks for the inspiration! Great card - such fun to color with the copics. I love garden scenes, so this one really brought a smile to my face. Great job, I just Love your cards, thanks for sharing. Such a fun card! I love all the elements- great for Spring cards and scrapbook layouts! OMGosh this is so adorable, love it. Amazing card! Thanks for sharing. Wow, this is a very stunning card. Thanks for sharing. Such a pretty scene you created on your card! Love how you colored the dies, really brings them to life! Great card! That is the cutest gardening scene! Love all the new MFT products! Oh that is just darling! A beautiful, Spring-y card full of fabulous detail! Love that adorable spring scene you created! Such a fabulous release! That is one sweet card Julie and I LOVE how you finished the inside. Beautyfull garden card, it is perfect for sping. Lovely card, perfect for a gardener! Such an adorable card! Says Spring all over! Ok that looks like it could be a framed artwork! It almost looks real!! Bravo! That is amazing! Stunning work! The sponging highlights really make the images pop! Love this sentiment, its perfect!! How cute is this little scene?! This is so adorable! Love the scene you built! TFS, Jules! What a pretty little garden spot you've created!!! Such a pretty card! Love those happy flowers and that they SPARKLE! Oh, your card is so pretty and so very happy! I love the flowers and sparkle! This die set has SO many great pieces! Your cards are so cute! The sentiment made me giggle. Sweet garden scene Julie. Love the fantastic coloring on the die-cut images. Wow love the coloring on this card! Thanks for sharing! Love this scene, it's so realistic looking. Beautiful work. Beautiful! Love the scene you created. Great job coloring the watering can and tools, I didn't think they were just colored with copics, they look so different than just plain coloring....a kind of textured look...not smooth. Tickled to see that see highlighted. I just purchased it and am looking forward to using it. I have enjoyed reading your blog this week. All of the cards are beautiful!! That is fab! I love this set and know just the person I want to make my first card for with 'em! Beautiful work! I love this card! Wonderful spring card...love the depth created with the shading on the die cuts. This is adorable!!! The little die cuts are all so perfect that the scene almost looks real! Great job creating this one! 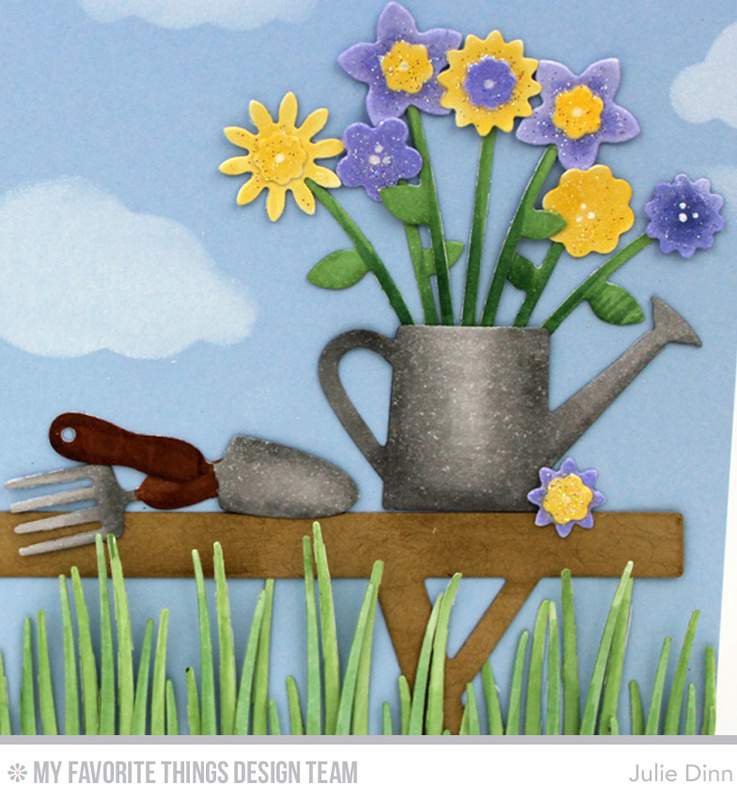 The garden tools are so cute; what a great addition to spring flower cards! Oh wow! Beautiful card!! Such great detail with those spring flowers!! Your coloring skills are amazing and then you match them with your card design! Thanks for sharing! Wonderfully created gardening scene! Love these cute dies and your coloring is so nice! Oh my goodness!! This is the most creative and adorable scene ever!! Truly creative and truly inspirational! Fabulous card!! So much detail and creativity! Love it!! Beautiful! The can and pots look so real! What a great spring card! Oh my goodness, I LOVE your card, what a great scene!! Love the springtime look of your card! I love love love these new spring releases! Your coloring of the water can is fabulous! How'd you do that? Also, you did a card with the I Tweet You and it was done with three little red heart ornaments hanging from the tree. Where did you get the red hearts? I did a search and can't find them! The coloring makes the tools and pots look so real! Great card! Love your coloring of diecuts. Great release. Great products! Unique! Great card! Hi Julie!! Isn't this the most fun die set to create with?! I love your garden scene and copic coloring. Thanks, Paulette S.
This is amazing, I love this card! Awesome project. I am so ready to plant flowers! the scene that you create is awesome! Really digging the garden scene. (pun intended Ha!). Totally in love with this spring garden die-namics. The colouring on the die-cuts is amazing! Such a wonderful springtime scene. I am ready for it. Love the scene you created with the Spring Garden dies. Cute card. Tks. Wow Julie! Your card is amazing. It looks three dimensional. Wow, the sentiment inside did not take my eye when I first saw the new products on the MFT blog, but seeing it used, what a difference. Love it! !